Take a bite- a small and cosy café at Taramani, Chennai serves quite a large variety of food in a perfect ambience. This café is run by two strongly determined women entrepreneurs Ms. Pinkey Arya and her partner Sarumathi. The care we give you is felt in the taste of the food. Behind this café and its taste is a team who supported the success of this venture. Our master chef helped us a lot to put up a unique menu which tastes uniquely delicious and we are thankful for that. Our well-wishers, Ms. Ruby Arya, our Auditor, and others have given life to our dream. 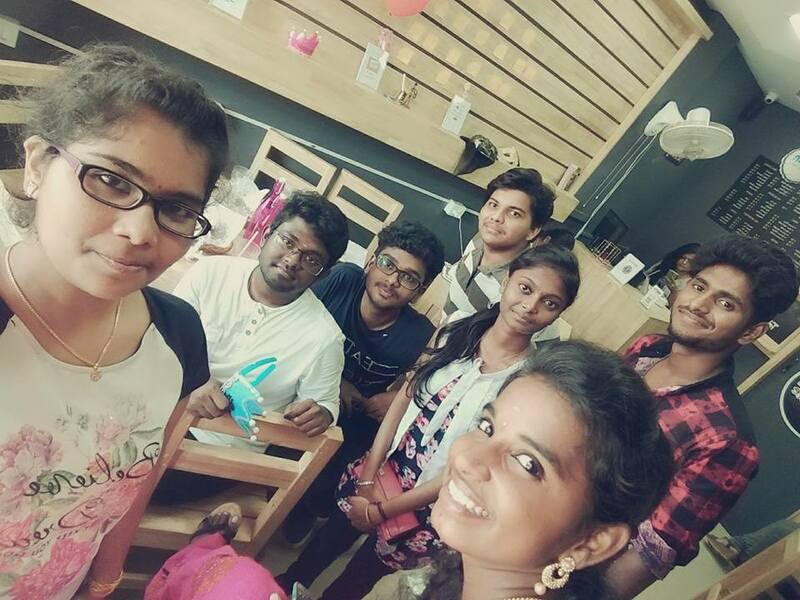 This café is visited often by the youngsters; it has a huge following among the kids. What is unique here? Come and try our different burgers, (Tandoori chicken, chicken tikka, Tuna Fish, veg, aloo tikki, etc) sandwiches. You will experience variety like never before. To make yourself cool, have our ice blenders. You will love our milkshakes because its loaded with ice cream. And have our other range of yummy chicken nuggets chicken wing french fries. Salads are also available. Dont worry if you are a vegetarian; You will have blast too with our aloo achar wraps, spicy paneer wrap, chilli cheese toast, corn and cheese and etc. not to forget our frappes.. and everyone’s favorite maggiiiiii!!!!. What is Special in Take a Bite? 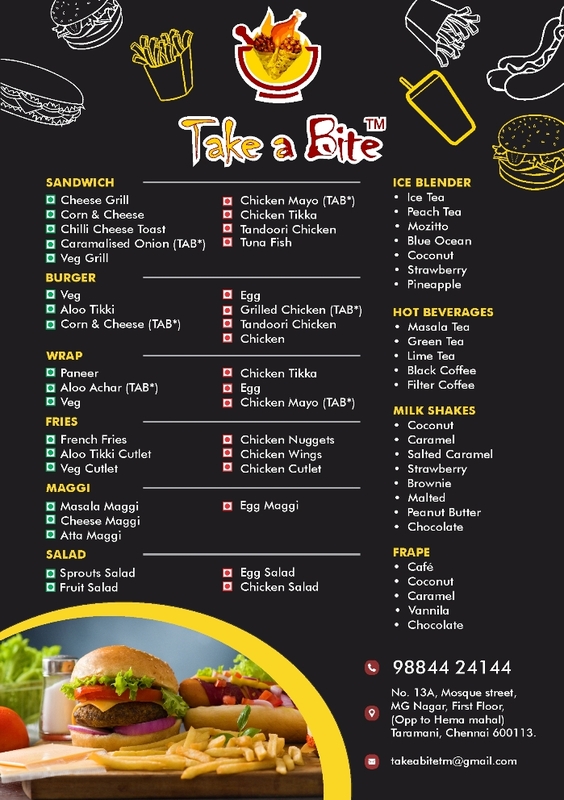 Chicken Mayo Sandwich, Caramalised onion Sandwich, Corn, Cheese burger, Grilled Chicken Burger, Aloo achar Wrap, chicken Mayo wrap, Maggi, Masala Tea, Filter Coffee are our specialties; you never taste such tea and coffee in any café. Crazy about selfie? We have selfie props to make a perfect selfie of the day. Feed yourself, also feed your mobiles, Yes! we provide Free Charging. One of the reasons behind the yummy and unique taste of take a bite is we bake our buns and bread ourselves.. So we always use fresh ones.. fresh things always add to the taste. We have our own baked cookies and chocolates. Previous articleஇந்த மக்களின், இந்த மண்ணின் ஊடகம். இப்போது டாட் காம் – உண்மையாக; உங்களுக்காக.